I would have sworn that I had posted this wonderful cookbook before but can’t find it anywhere, so here it is, in all it’s glory! Nero Wolfe, often billed as the greatest detective in the world, owes much of his impressive bulk to his all-consuming interest in food. After years of pleading from faithful readers, Rex Stout, author of the more than sixty Nero Wolfe stories, finally served up this delightful collection of over 225 recipes for the fabulous repasts detailed in the mysteries. Some of the culinary concoctions are of Wolfe’s own making (the Kanawha Spa dinner, for example), but most of them have been prepared exclusively by his faithful and ingenious majordomo, Fritz Brenner, who can whip up perfect shad-roe mousse Pocahontas, corn fritters with wild-thyme honey, hedgehog omelet, or fig souffle without batting an eyelash. 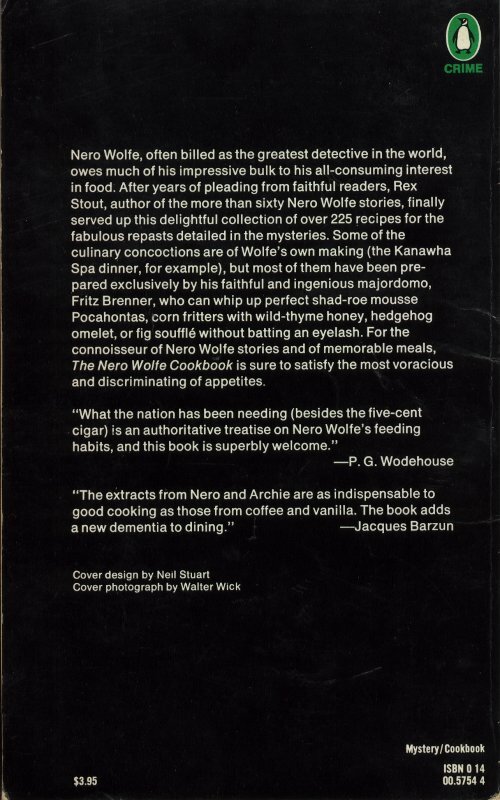 For the connoisseur of Nero Wolfe stories and of memorable meals, The Nero Wolfe Cookbook is sure to satisfy the most voracious and discriminating of appetites. Barbara Burn’s name should be on the title page. The comments and explanations in italics are all by her, as well as the final wording of most of the recipes. 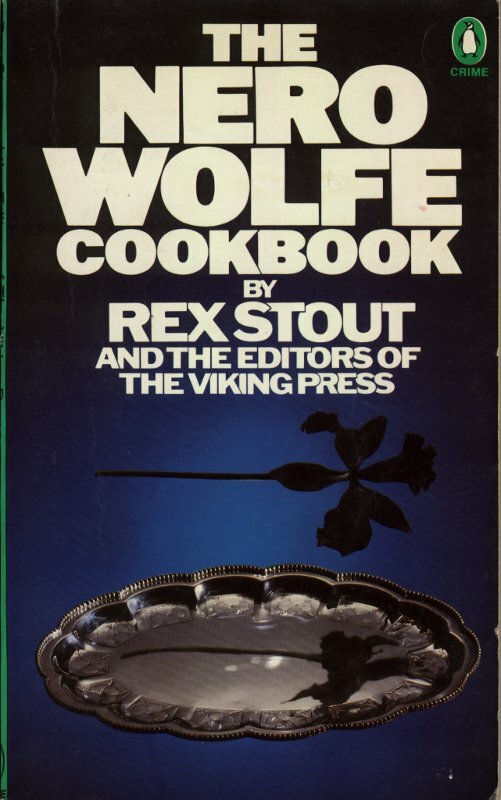 Without her there would have been no Nero Wolfe cookbook. She also tested, or supervised the testing of, many of the dishes. I thank her warmly. I thank Michael S. Romano, who tested more than half of the dishes and wrote the first draft of many of the recipes. I thank Helen Taylor, who chose and collected the excerpts from the stories and tested a few of the recipes. And I thank Marshall Best and Laurie Colwin and Mary Chambers and Barbara Morris and Susan Mabon.